Yoga & Eating Disorders: a blessing or a curse? With the current emphasis on the Yoga body, as imposed by social media, I have been asking myself if the role of Yoga as a healing therapy in body-image related issues is somehow getting lost. One of the main plague for women of all ages, eating disorders are constantly on the rise the world over. On one side, we have health issues related to overeating (from bulimia nervosa to obesity), on the other extreme the cases of anorexia are now spreading well beyond the teenage range. Coming from a generation of older yogis, my approach to this discipline was towards a physical form of meditation that could allow me to get into deeper touch with my body as a vessel to my spirit – when I started practicing Ashtanga, 20 years ago, instagram and facebook were not around, you had to buy videotapes (and there were not many available) and old-fashioned books (which I still love). Handstand craze was not even contemplated and yoga and acrobatics were clearly far away from each other. I actually started practicing Yoga after years of professional dancing, and was looking for a discipline where glamour outfits were not in the picture: actually, the beauty of it was that I could finally enter a place where mirrors were banned, everybody was NOT wearing makeup, and where old leggings and a tank top were all you needed, considering you were going to sweat a lot. It was a relief. I took very seriously my teacher’s instructions: it is not about looking what your mat neighbor achieves, it’s about how you FEEL in each posture, it’s about being able to breathe in each posture. Everybody’s jaws were relaxed. If a posture was causing too much effort to be gained, the teacher used to stop us and invite us to explore the previous one with great care. From that point of view, I could see how helpful all yoga practices (whatever the method) could be to women suffering from an eating disorder. To overeaters, it was a step towards acceptance and slowly shedding overweight, without putting too much emphasis on dieting but rather, on breathing in order to activate the natural sense of healthy appetite in our brain. To anorexics, it was again a way to relax and learn how to let go, to stop controlling and thinking that life could be all right if we only lost yet another pound. What I am seeing today, however, is worrying me. Social media are representing yoga as the new fitness craze. Body image, once again, seems to be the main issue. You are going to be a successful yogi if you can bend like a circus contortionist, or balance on your hands as a gymnast. And of course, you have to be wearing expensive outfits and make up in order to shoot great instagram pics. Compulsive behaviors have moved from the gym into the shala. The instagram is full of beautifully trained and fit girls claiming “Yoga made me accept my body”… Actually, I would be surprised if they wouldn’t, being so perfect! Are we loosing sight of the therapeutic aim of Yoga, and turning it into aerobics 2.0? I am not saying that we should turn back the clock. Social media are here to stay. Yet, is it possible to make a better use of them? Is there a way to present Yoga in a healthier way?And outside the internet, back in the real world, are Yoga teachers paying attention to their practitioners, making sure – when they are coming from such difficult backgrounds – they are teaching in a way that actually encourages self-acceptance and avoids competition? Is Yoga a blessing or a curse for women suffering from eating disorders? I believe the role of the Yoga teacher can dramatically change how a practitioner feels about herself. Sometimes, that can mean turning a student to a more challenging or more relaxing practice, if our experience tell us that this can offer the practitioner a better chance of spiritual growth and a healthier approach to their body. As yoga teachers, in a very competitive market, I believe we should never forget to place our customers’ spiritual and physical health in the first place. People suffering from eating disorders are psychologically very challenged, and sometimes physically frail. Let’s not forget that in our culture, body image is paramount and to make sure its worst aspects do not enter our shala we have to make our best efforts to create a non-competitive, accepting atmosphere, so that the practice can be a safe harbor for those who need it. Let’s make Yoga a blessing, and not a curse. I have been long waiting for this book to arrive. I met Taylor Hunt in Mysore last December while attending KPJAYI. We had a facebook connection and as many Ashtangi, I was following his dedication to the practice – I was struck by how inspiring and empowering his posts were, and how strong and balanced the practice made him look. Then I discovered he was about to publish a book about his path in Yoga. Turns out, Taylor is coming from a very dark past of alcoholism and addiction, and through sheer will and Ashtanga Yoga, he is now a very successful Yoga Teacher (yes, capitol letters, since he is Authorized Level 2 by KPJAYI) and a wonderful family man. He runs a very popular Mysore Program, travels to give Yoga workshops and intensives, but most of all, he is inspiring all those struggling through the difficult path of recovery and rehab with his powerful message. What happens when all this becomes a book? Well, I was about to find out. I asked Taylor if we could meet up in Mysore: teaching myself and being a translator for Italian Publishers specialized in Yoga and Spiritual literature, I am always looking for interesting projects, and this sounded just what I was looking for. Taylor knew nothing about me, yet he was kind and open-minded enough to invite me at his family home in Mysore, where he was spending his usual three months of practice with Sharath. I was struck by his warmth and by his lovely wife and children. I could immediately sense the harmony that surrounded them. And Taylor had that brightness in his eyes, the one you find in those really committed to the practice – when you practice every day, year after year, no matter what, your eyes become crystal clear and seem to read through the people you meet. This book obviously meant a lot to him. It is his own life that he was about to disclose to the world, all details included: no matter how hard, difficult and sometimes even shocking they could be. Taylor was ready to share his hardship with all of us – seasoned practitioners as well as beginners, and of course people still struggling with drug, alcohol or any other form of addiction. Taylor was telling me about it, and I was already looking forward to reading it – not because I had some sort of morbid curiosity but because I could understand how impactful such story could be on so many levels. Of course, I immediately pre-ordered my copy. And that copy finally arrived. As I imagined, this Yoga book is actually a book for everybody. I see it as a contemporary, down-to-earth version of “Autobiography of a (western) Yogi”, that actualizes the message of Yoga in a very grounded, accessible way. No sudden, sci-fi enlightenment story but the powerful, honest account of a path full of hurdles towards a pacified mind and a sense of purpose in life. 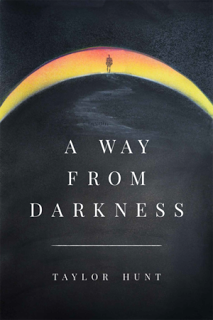 Written in a style that keeps you hooked as a best-selling author’s novel, “A Way From Darkness” relates to each and every one of us. In Taylor’s words we can find our own struggles, our everyday battles. Whatever drove us towards yoga, we were all coming from our dark place hungry for answers, and in one way or another, Yoga helped us find these answers within ourselves. Through Yoga we got (or are getting) rid of old habits and patterns, rebuilding ourselves. It is sometimes a life-long task, but we enjoy (and at times endure) every single step of it.